Home › Ranting and Raving › Merry Christmas or Mass Chaos??? We are supposed to leave for Colorado in two days. There’s a blizzard warning for 24 hours starting at 6pm tonight. Chris couldn’t come home last night, and won’t be able to come home tonight because of the blizzard (he has a LONG commute to work). My computer has a virus. Baby Lainey partied all night and I got 3 hours of sleep. In the middle of my 3 hours sleep, my phone went off. It was a “severe alert” about the blizzard… then it asked if I would like to receive regular “severe alerts.” Unfortunately, I could only click “yes” or “no”. The “I already receive severe alerts all night from my daughter – send me one again at 3am and I will hunt you down!” button was missing. Devin let me know this morning that he heard Lainey cry at 6:50am and it woke him up ten minutes earlier than usual, so I shouldn’t be surprised if he’s tired today. Must be rough. 🙂 I’m not ready for Christmas. I’m not ready for our trip. Writing lists makes me feel better. First, I was writing a list of things to do before we leave, and I felt better each time I crossed something off. But every time I crossed something off, I had to add two or three NEW things to the list. So I started another list. I made a list of things to write about in this blog post and every time I finish writing about them, I will cross them off. Forget that other dysfunctional list. You should try this list thing. It’s like therapy. Yesterday, I dropped the boys off at school, then dragged Lainey around all morning with me to finish the Christmas shopping. At lunchtime, Chris called me and I was so happy to tell him I was finally done and about which things I had gotten for which people. “Why did you get such-and-such for so-and-so?” he asked. That’s it. I’m on strike for next year. No cookie baking, no shopping, no cards, no wrapping, no organizing Christmas dinners… His intentions were perfectly innocent, but by evening I was texting him that I hate Christmas anyway… that it’s turned into nothing but presents and more presents and wasting time and money and nobody remembers what Christmas means anymore. “That’s my little Grinchette,” he texted back. I guess my heart is two sizes too small. …Or I did, until trying to get him and Wesley to decorate Christmas cookies together Monday after school. Who knew brothers could even get into an argument about pink sprinkles (when left with nothing else to argue about)? I had to tear myself away from the majorly important, possibly life altering pink sprinkle argument to pick up Lainey. She had been crawl-hopping (sometimes she crawls, sometimes she crawl-hops) across the kitchen floor after a red rolling plastic cup. Every time she caught the cup and touched it, it would roll away again. She was crawl-hopping furiously – determined to get that red cup – when her hands missed their mark and she face planted into her target (if you could imagine a rabbit hopping around and suddenly it’s front paws disappear and it lands on it’s head). That red cup was now infuriating, when it had merely been interesting a moment ago. Have you ever seen a baby babble angrily at an inanimate object? Fortunately, Chris tag teamed me when he got home. I finished getting dinner ready while he played with the boys and Lainey, we had a peaceful (and yummy) dinner of Italian Beef, and then Chris read to Devin and Wesley until they fell asleep. The kids’ Christmas singing concert at school was that day, and Devin was freaking out because he didn’t know how to put on his tie. I don’t know how to do one, (I guess I better learn) and Chris had already left for work. Devin has 2 clip on ties, but he was adamant that only babies wear those kind (seemed to be a matter of life and death). He called Chris on the phone and was trying to have Chris instruct him in putting on a real tie… this didn’t work and then Devin started getting mad at Chris and told him that he was no help and it would probably be more help to just Google it. Oh boy. See… Chris had tried to teach Devin how to put on his tie for Devin’s band concert, and Devin didn’t want to learn, he just wanted someone to do it for him. Oh how things had changed by that morning, when Devin decided that putting on a real tie was a rite of passage into manhood. He ended up going to school very unhappy with a clip on tie and Chris promised to help him with his real tie for the evening concert. A couple days before this, Wesley, who is already on allergy medicine for coughing/pre-asthma, suddenly developed a skin allergy. I’m supposed to put moisturizer on Wesley and use a prescription Steroid if that doesn’t help. That Thursday morning, as Devin and Chris were arguing about the tie debacle on speakerphone, Wesley was standing in the middle of the living room in his shorts while I put moisturizer on his skin (and telling me how embarrassing it was to have his mom help him with this). I was yelling across the room for Devin to just wear a clip on tie, and was being ignored by both Devin and Chris. Lainey was in her high chair babbling furiously at me because she had run out of cheerios and wanted something more to eat. I finished with the moisturizer and Wesley started running around the house in a panic saying he couldn’t find his black corduroy pants (5 minutes later he said he found them stuffed in a corner). Then Wesley’s tie was missing, and Devin (who had hung up the phone on Chris 3 times by now) admitted that he put it in his backpack in case he couldn’t tie his other one, because Wesley’s clip on tie was much cooler than Devin’s. I tried to call Chris back and he didn’t answer — I’m sure he assumed it was Devin calling to yell at and hang up on him again. I retrieved Wesley’s tie, Devin continued to grumble about Wesley having a better tie, I couldn’t find Lainey’s container of “Puff” crackers to feed her until I went outside and checked the recycling bin (thanks, Chris)… and miraculously, the kids were only 4 minutes late for school. I didn’t know whether or not I should publicize the “Family Circus” cartoon inspiration that goes on in our home sometimes… but I figure I can’t be the only mom who doesn’t have it all together every moment of the day, and thought I should break the silence. 🙂 By the way, chocolate almond milk is delicious and it’s a wonderful coping mechanism for mass chaos. I’ve now crossed off everything on my list! About that other list… I have a sudden craving for some chocolate almond milk. 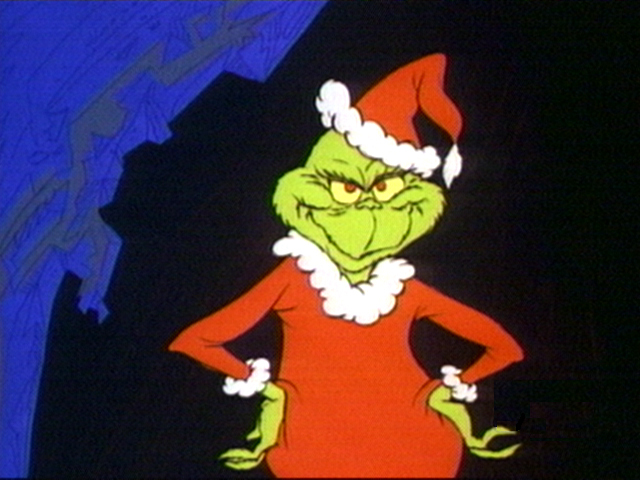 *The Grinch, a bitter, grouchy, cave-dwelling creature with a heart “two sizes too small,” lives on snowy Mount Crumpit, a steep, 3,000-foot (910 m) high mountain just north of Whoville, home of the merry and warm-hearted Whos. His only companion is his faithful dog, Max. From his perch high atop Mount Crumpit, the Grinch can hear the noisy Christmas festivities that take place in Whoville. Annoyed and unable to understand the Whos’ happiness, he makes plans to descend on the town and deprive them of their Christmas presents, Roast Beast, Who-hash and decorations and thus “prevent Christmas from coming.” However, he learns in the end that despite his success in taking away all the Christmas presents and decorations from the Whos, Christmas comes just the same. He then realizes that Christmas is more than just gifts and presents. Touched by this, his heart grows three sizes larger; he returns all the presents and trimmings and is warmly welcomed into the community of the Whos.